Two more fun, inspirational additions to the PO range. Speak is the pick here though - we can see it inspiring whole tracks! Speak’s handheld vocal synthesis is genuinely unique and very inspiring. As with all the POs, the global effects are a highlight. No-mute or solo for individual sounds. Editing sample parameters is fiddly and confusing. KO! 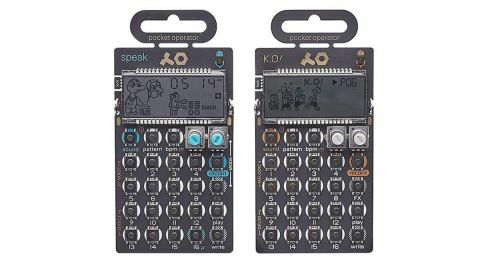 and Speak are the eight and ninth additions to Teenage Engineering’s Pocket Operator range, joining last year’s PO-32 Tonic to complete the ‘metal’ series, the unifying characteristic of which is the addition of a small mic to the top of each unit. While the first two batches of POs were effectively sound players - pre-loaded with samples of synth tones - this latest trio use the upgraded hardware to add an extra layer of flexibility to the PO formula. However, where the Tonic used its mic purely for data transfer - allowing preset import and sharing - these two new instruments both use their mics as a proper audio input, allowing KO! and Speak to function as a sampler and vocal synth respectively. As with previous POs, each instrument features 16 sounds laid out across its main 4x4 button grid. In the case of the KO! these are 16 sample tracks, with a shared sample memory of up to 40 seconds. These come pre-loaded with a selection of sounds, but each can be easily overwritten by recording via the mic or mini-jack input. The sample tracks are divided into two banks for eight, labelled Melodic and Drum, which behave slightly differently when played via the pad grid or sequencer. In melodic mode, the PO’s 16 ‘keys’ function like a chromatic keyboard, allowing the sample to be trigged at different pitches. For Drum tracks, however, these 16 keys become a sample slicer, allowing longer recordings to be chopped up into multiple chunks, with editable lengths and start points. This effectively allows a single sample track to trigger multiple sounds across its 16 sequencer steps, although the KO! is four voice in total, so it can trigger a maximum of four sounds from across the 16 tracks on any one step. Each sample track has six editable parameters: pitch, volume, filter cutoff - controlling a single bi-directional low/high pass filter, filter resonance, sample start point and sample length. For the Drum tracks, each of these can be adjusted individually for each of the 16 slices. Along with these parameters there are 15 global punch-in effects which range from filter sweeps to stutters, rolls and a reverse effect. All parameter setting and effects can be recorded into the sequencer as parameter locks. All told, there’s a surprising amount of functionality to the KO!, given its size and simplistic look. That said, accessing a lot of this functionality via the PO interface is fiddly. As with all the Pocket Operators, both KO! and Speak feature LCD screens, but these function mostly as fun, largely aesthetic graphical displays, and only offer minimal amounts of parameter feedback. Unsurprisingly, the sound quality is fairly lo- too, though this does lend a nice crunchy, old-school quality to the KO!. It’s fun to mess around with though - while it can be tricky to get super precise with sampling and sequencing, recording a few clips and haphazardly messing around with them is a great way to create spontaneous little hooks, loops and unexpected sounds. For our money, however, Speak is the standout of these two new POs (and possibly the whole range, to date). Created with Sonic Charge’s Magnus Lidström, who also developed the PO-32 Tonic, Speak is a vocal synth that lets users sample short chunks of audio and process these via one of eight ‘voices’. The setup is slightly different to that of the other POs - where previous instruments in the series have contained up to 16 sounds that can be sequenced simultaneously, Speak is only two-voice, albeit with 15 sample slots available to the vocal synth voice. Each of these slots can be filled with up to eight seconds of audio, which can then be played back at different pitches using the PO’s sequencer grid, in a manner similar to the KO!’s melodic sample slots. Again, we have several parameters that can be adjusted and automated for each sound - sample start point, playback speed, root pitch and formant characteristics. As with all the previous iterations, both KO! and Speak are rough-and-ready, battery-powered hardware units with a footprint not much bigger than a credit card. Both pack a built-in speaker, along with a mini-jack input - used for pulse sync and audio - and a mini-jack output. The POs are fairly robust, despite their vulnerable-looking exposed innards, but each can be spruced up and protected with the addition of the silicone ‘pro’ case, available from TE for an additional £25. Both have screens, albeit offering a fairly limited amount of parameter feedback. They’re mostly dedicated to cartoon-like graphics (plus an alarm clock). Both POs have 16-step sequencers, which can chain patterns (up to 128 for the KO!, and 64 for Speak). Both lack sound mute/solo though, which is a pain if you want to record sequences into a DAW. The eight Voice modes then offer different manners in which these samples can be processed: Natural mode plays the sample back with minimal processing; Autotune applies a pitch-correct effect similar to the plugin of the same name; Retro adds an old-fashioned radio-like quality; Noise imparts white-noise like characteristics; Robot adds a digitised ‘speech’ effect; Fifth plays the sample back as a two-note, fifth-spaced harmony; Vocoder processes the sound via a classic vocoder effect; and Synth blends it into a full synth tone. There’s lots of fun to be had when trying out these Voices on different snippets of vocal, spoken words and found sounds. As with the KO!, Speak can sample both from the mic and via its audio input, the latter of which is great for grabbing quick samples from sources like YouTube, TV shows, radio or audiobooks for slicing up and manipulating. Changes in Voice mode can be recorded into the sequencer too, so you can build up some cool effects by changing mode mid-sample, and chaining multiple sample sources together into one single sequence. Speak’s other voice - allocated to sound slot 16 - is a single channel of drum sounds take from the Tonic. This is a nice little tool for adding basic grooves under sequences. As with the Tonic, these sounds can be replaced with presets created in the MicroTonic plugin. Again, there’s also an onboard bank of excellent on/off global effects, albeit trimmed down to just eight varieties here, as the other slots are occupied by the voice modes. While, despite their limitations, all the POs are fun noise generators and great for inspiring incidental sounds, Speak is probably the most useful Pocket Operator we’ve seen so far. Its ability to sample, trim and process vocal sounds make it a great little tool for creating little one shots and vocal hooks - we can see users creating whole tracks based around the effects it creates.